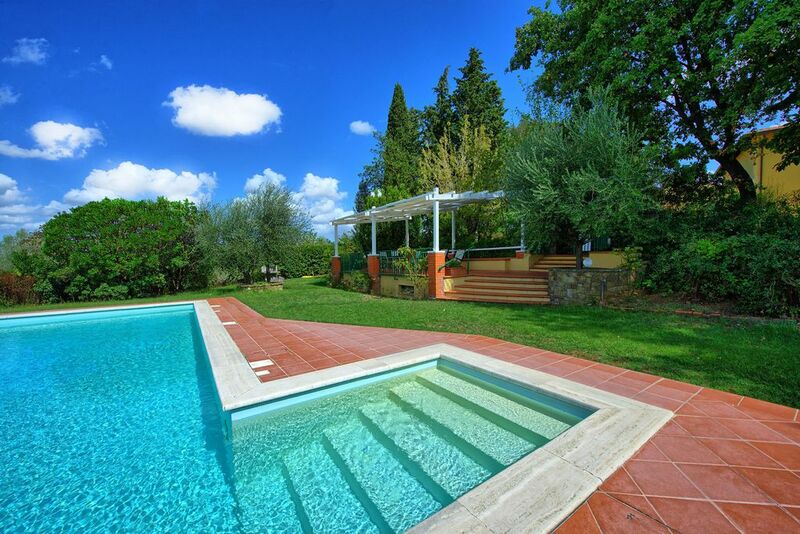 Welcoming farmhouse with private pool situated in quiet and panoramic location on hills surrounding Florence. This property is a short distance away from the village of Montagnana and from the nice town of San Casciano Val di Pesa. The interiors are nicely furnished in a rustic style and are suitable for large groups and families with children. Outside guests can enjoy use of large areas with a private, entirely fenced-in pool. The charming Chianti Classico villages are in easy access within 35/50 km. Distances: Montagnana with grocery, nice restaurant, gas station and post-office 1,5 km away, Cerbaia with general stores 3 km, San Casciano Val di Pesa 10 km away, Florence (airport) 20 km, San Gimignano 35 km, Siena 60 km away, Pisa (airport) 75 km, Lucca 80 km. The Tuscan coastline area (Livorno, Castigliocello, Cecina) is approx. 100 km away. The nearest bus stop with connections to Florence is located just 700 meters away from the house. At guests’ disposal: covered furnished terrace accessible from the kitchen, garden, fenced-in swimming-pool (11 x 6 m; min. depth 1,2 m – max. depth 1,8 m) area with garden furniture. The villa also provides a nice playing room (created by restoring former stables) with table-tennis, billiards and piano. Washing machine available in the covered terrace. Internet connection (WI-FI, free). Extra Services: 2 baby beds and 2 high-chairs are available upon request (free of charge). The villa is provided with an automatic system spreading out a natural instecticide in the outer perimeter of the villa in order to prevent the presence of insects. Ground floor (access via a furnished loggia with table and chairs): kitchen (oven, freezer, dishwasher, toaster, American coffee maker), living-room (satellite TV, DVD reader, hi-fi), dining-room, large playing room with table tennis, billiards and piano. 3 steps lower: bathroom with shower. 1st floor: living-room with large fireplace place, double bedroom with air conditioning, 4 twin-bedded rooms with air conditioning (all of the bedrooms can be turned into doubles upon request), bathroom with Jacuzzi bathtub, bathroom with shower. 5 steps higher: bathroom with shower. Very nice typical Toscane house! Great situation. Nice welcome! Das Haus ist etwas altertümlich eingerichtet, was aber sehr gut zu dem Haus und den schönen Böden und Decken passt. Der Besitz ist nicht echt auf dem Lande, obwohl man sich eigentlich so fühlt und alle Vorteile geniessen kann: es ist ruhig mit einer wunderbaren Aussicht. In dem Ort Montagnana kann man auch zu Fuss einkaufen gehen (ein bisschen Zeit braucht man allerdings) und es gibt eine Pizzeria, die zwar nicht schön ist, aber die beste Pizza der Welt backt. We were a party of 10 and this Villa was fantastic ! The photos represent the villa perfectly. It was very clean and beautifully decorated. Appliances worked very well. We loved sitting out by the pool in the evening. The owners were very welcoming and made sure that we had everything that we needed. It was situated very well for day trips to Pisa, Firenze, Volterra, San Gimi, Sienna etc. Save time to enjoy this property though!! La propiedad de San Carlo en la tostana que alquilamos este mes de julio era impresionante, tanto en ubicación, limpieza, trato y mantenimiento.